Luton manager Nathan Jones conceded it may well come as a 'blessing' that his were knocked out of the Checkatrade Trophy by Southend United on Tuesday night. With the Hatters firmly in the promotion shake-up in League One, sitting third in the table, and also travelling to Sheffield Wednesday in the FA Cup third round next month, then Jones admitted the lack of distractions could prove handy going into the second half of the season. 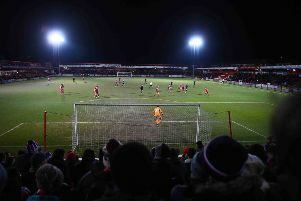 Although he made 11 changes for the second round tie, the players selected were very much with the emphasis on going through as Danny Hylton, Dan Potts, Alan Sheehan, Marek Stech and Jorge Grant were in the League Two Team of the Year last term. However, after drawing 1-1, the Shrimpers came through 4-2 on penalties to end Town's run in the competition, with Jones saying: "We wanted to go through, under no uncertain terms, we wanted to go through. “But in all honesty, with the priority being the league, that is the priority. "I’m as much worried about fatigue and as much worried about our pitch as fatigue, because if you’re playing on it twice a week, and we need a good pitch, we want a good pitch as it helps us to play. “But as you can see, it can affect fluency, so there’s a lot of factors. “You want to stay in this competition, you want to do well in all of them. "This might be a blessing as even though we’ve made 11 changes, we might not be able to do that for the next round, then we’re constantly preparing, disrupting weeks. He added: “Not just Danny, but people like Alan Sheehan, Dan Potts got 90 minutes, Jorge Grant, it was important for these to get those minutes. "They’re important members of the squad, Lloyd Jones needed that, his timing was a little bit rusty, so he needs that game. "We can’t get too disappointed, it’s a cliche, but the league is the priority. "We treat this with the utmost respect, this competition and there’s bigger battles to come, but we wish Southend all the best."